For the holidays my parents gave me a copy of Carl Zimmer's latest book Science Ink. To say I loved it would be an understatement. Which is why I see no point in reviewing it. There would be nothing balanced about my comments, I just think you should read it. However, Science Ink inspired me in another way, so stay with me for a moment while I make a different point. Science Ink isn't like any old book. I coveted Science Ink. I wanted to hold it, to feel the cut outs in the cover, absorb the colors, and let my hands glide over each page as I turned it. 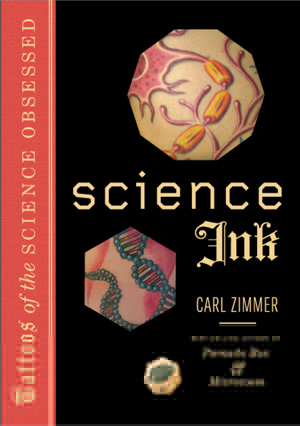 The subject matter of the book; science tattoos, what they mean, and why people get them; is fascinating. I was completely absorbed in each little story, and found something new to learn on each page. I already want a tattoo, and it made my mind swim with the possibilities. But what I took away from Science Ink more than anything else, was the sheer beauty of the book. The design of Science Ink is breathtaking. I thought it was just spot on. I honestly don't know what I would change about it. The pictures are beautiful, but beyond that - the font feels ancient and perfect, the colors are vibrant but somehow dark the way I think a book about tattoos should be, the cut outs in the cover are a clever surprise, and the rough texture of the red spine with its gold lettering is completely satisfying. The smooth mat of the page excellently frames each photograph, with just enough sheen to make it feel fresh and new. I was even obsessed with the index for crying out loud. Now, if this is starting to sound like a love letter to a book, that's because it is. Not just to a book, but to a PRINT book. I get the purpose of digital books, I do. I envy my Mom and Dad, who have a Kindle Fire and and iPad respectively, while I'm still living in the dark ages flipping pages with my whole hands rather than just the tap of a finger. I've commuted to and from New York City on the train and subways enough times to know that carrying around a book like Jared Diamond's Guns, Germs, and Steel (which I did for two months this past summer) is a neck ache waiting to happen. Not to mention the ecological benefit to going paperless and saving all the resources (trees, water, energy) that go into making print books. I wouldn't mind having a digital platform to read on, I think it is definitely the way to go. Still, I argue that there are some books that just can't be done justice with a PDF or a picture on a screen. Science Ink is one of those books. Not that I would ever encourage any of you digital readers to skip it - the stories behind science tattoos are clever, meaningful, funny, and astounding (as they should be) - I just think that the print version is worth taking in yourself. Reading it was an experience that attacked multiple senses, and I just don't think it would have been the same if I hadn't been holding the book in my hands. The subject matter is art, and I'm sure that has a big part in making the book so beautiful. But for me, the design set the book apart, and sent it soaring right over the top. The experience of reading Science Ink, brought me back to a topic I played around with last semester in my multimedia journalism class. UW recently opened a new wing of the Chazen Museum of Art, and I interviewed the director Russell Panczenko about the role of an art museum in a digital world. I had some problems with the piece, chief among them that I don't know if I really got to the heart of the issue. I guess what I was trying to communicate - which Science Ink helped clarify in my mind - is that just because digital platforms make it easier to read books or look at paintings, doesn't mean that the multi-sensory experience of taking in a piece should be forgotten. That is what print books and art museums have that a little screen just doesn't. I'm all for moving forward with technology, I just don't want to lose my senses in the process. That is the point. Erin! That is TOTALLY the benefit of having print books! I love when artists and publishers recognize the value of the book as a medium and take advantage of it. The tactile, haptic experience you had reading that book is something that no other medium can equally convey: it just doesn't translate. Available digitally, the book would lose something, though, if done right, it could also gain something else. Just like the transfer of a novel to film: there are certain things inherently literary and certain things inherently cinematic that just can't be done by the other. Each iteration of the information in various media will lose something, but, if done consciously, could gain something too. Beautiful post! I want to go out and buy the book right now so I can run my fingers over the pages. Very good point Cassi! There have got to be elements that a digital platform uses to enhance the reading experience, but I'm glad you agree with me about how print can attack multiple senses. The book is awesome, I recommend it (obviously)! I am guilty of reading books on an iPad and iPhone. Kindle versions of books I buy through Amazon are much cheaper than the printed version. I can also read them on my PC at work, under the nose of the boss when I am bored or needing to read that next chapter. "Science Ink" wouldn't be as much pleasure in a commuting environment. It would have to be set aside for reading in your favourite chair or on your bed, where the tactile senses are at their best! Very true John, it is hard to argue with the convenience that a Kindle or other digital platform offers to readers. I got to read Science Ink while I was home, which definitely impacted the experience. But, I do think that just like we put rare paintings in a museum to be observed and taken in, so too should the rare amazingly designed books be preserved and experienced in tangible way. It isn't just what you read, but how you read it that makes a difference in the impact a piece has.